The famous Jai Mahal Palace of Jaipur bears the history of 260 years of Indo-Saracenic architectural splendor. This palace is made of 1745 AD has now become a major tourist 5-star deluxe heritage hotel. It is made by Sawai Ishwari Singh's Military Commander and Prime Minister, Hargovind Natani. In this palace hotel, there are 100 rooms including 6 suites. The Jai Mahal garden has a tiered waterway that flows past stone pavilions into fountain pools. This palace hotel is entirely decorated with foreign style furniture, miniature paintings, gold-hued silks, sheet curtains and stylish bathrooms offer contemporary comfort with a royal touch. All the rooms have a tea and coffee maker, mini bar, safe, color TV, direct dial telephone with satellite programs and hair dryer. Wi-Fi connectivity is available. The palace has been re-furbished by the Taj Group of Hotels. Hotel Facilities : Luxurious rooms & suites , Options of smoking & non-smoking rooms,Complimentary Wi-Fi , Fine-dining Restaurants,Marigold Bar,La Patisserie Cake Shop, 24-hour in-room dining, outdoor pool, Fitness centre , Yoga facilities, 24-hour on-call doctor & nurse, Outdoor parking facility for up to 120 cars, Concierge & multilingual staff and more. Rooms Facilities/ Amenities : Large flat-screen LCD TV, Plush bathrobes & slippers, Forest Essentials bath amenities, Complimentary basic Wi-Fi, Tea-coffee maker, Well-stocked minibar, Electronic safe, Daily housekeeping , Complimentary newspapers, 24-hour in-room dining, 24-hour laundry service and much more. 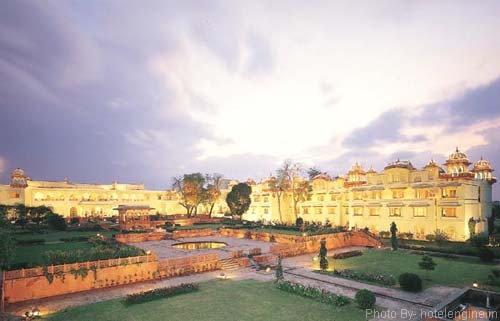 The restaurants at Jai Mahal Palace are Gulab Mahal, Hawa Mahal and Rang Mahal. The Gulab Mahal is a multi-cuisine restaurant where you can enjoy authentic Rajasthan delicacies along with Indian, Chinese, and other Inter-continental dishes. You can also have the facilities of spa, beauty salon, gymnasium at the Jai Mahal Palace Hotel.